Part of my job as an ethical fashion writer is to keep tabs on cool brands. Some of them reach out to me, some I discover through collaborations with ethical bloggers, and others I find through my own research. I’m going to share a few labels and designers with you each month in this new series. If you come back hunting for future posts, they will be tagged under ‘review’. When I endorse a brand it means I’ve done the homework for you. I’ve either 1) researched the brand’s ethical or sustainable policies to ensure they’re legit, 2) spoken directly with the brand’s staff to ensure transparency or, 3) asked the brand to provide samples so I can assess the quality and craftsmanship for you [I will indicate when this is the case]. My March lineup has one classic handbag brand and two fashion labels that will help you prepare for Spring. If you’re looking for more brands jump over to my shop ethical fashion page for a list that’s categorized to help you find a label for every need. I promise, there is chic [and affordable] stuff on it. You’ll never need to buy polyester fast-fashion again. Be sure to check out other things I’m reading and digging this month in the shoutouts at the end of this post. 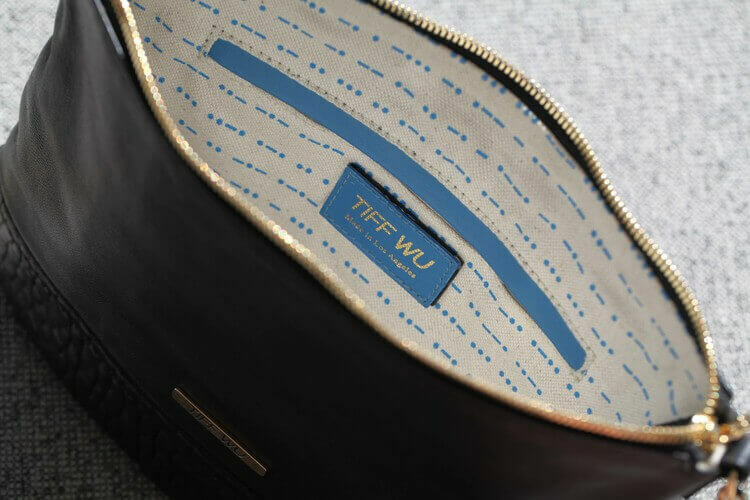 Tiffany Wu is a one woman show and she’s doing bags the right way. She makes a limited run of her ‘Essentials Handbags’ with a commitment to quality craftsmanship and fair pricing. She was nice enough to send me a sample of the black/silver bag to review and I’ve toted it around for the past few nights out. It’s roomy enough to hold all my essentials [forgive the pun] and it’s durable without sacrificing style. The substantial metal chain and textured leather detail at the bottom make it more original than others on the market. The leather is soft and supple. I can also imagine this bag wearing well if I kept it for an extended period of time. What You’ll Find: A not-so-standard cross body bag that can be dressed up or down. Extra touch: it’s lined in Morse Code, a special detail that will make you love it that much more. Ethics: US labor + hardware, Italian leather. Limited production output [she doesn’t make more than her buyers want]. This UK cult brand started as a small stall at Notting Hill’s Portobello Market in 2010. They founders grew up exposed to craft manufacturing thanks to their family business in the East End textile trade. They’ve infused this into every ounce of NFD. What You’ll Find: One-piece stunners [jumpsuits, slip dresses, duster jackets]. Androgyny and feminine charm in perfect symbiosis. Ethics: Handmade. Quality craftsmanship. Charity [A21 campaign to end human trafficking, eduction, economic empowerment]. Highlight Piece(s): Okay, I couldn’t pick one. PS – they’re having a Spring sale! *update as of 04/07/16: I ordered the dress pictured in the left and it arrived in the mail today. I was really disappointed to see it is 100% polyester (a man made synthetic often used in poor quality fashion) and not 100% cotton, as promised in the description. It is also see-through. I was so bummed that I fell prey to in-my-face greenwashing! I guess I should have been more leery of this brand with the reasonable prices. I contacted NFD via Instagram and they reached out to me to issue a refund (it’s going to be a headache with UK shipping). I wanted to share this story with you to show how easy it is to be led astray by so-called ‘ethical fashion.’ NFD may not be the MOST offensive brand out there, but they are certainly not what they promise. There aren’t any formal standards when it comes to regulating ethical fashion so the best we can do is to use caution, look for signs (I should have spotted them here with the low prices and insane amount of social media followers) do your research, and send back stuff that doesn’t cut it and explain why to the brand. For me, this was a lesson learned the hard way. But at least I can prevent you from making the same mistake. I can’t endorse NFD unless they seriously rethink the way they manufacture and market their clothes. Looking for a spring suit? Bikyni is a hyper-refined collection of mix-and-match essentials. What You’ll Find: Easy to shop swimwear that marries minimalism with contemporary silhouettes. Ethics: Fair pricing. US manufacturing. Support of craft Italian textile industry. I do have one wag of the finger for Bikiny [or call it a point of improvement]. The fabrics they use are not ideal or environmentally friendly. They blend polyamide [nylon] and elastane, which are both petrochemical intensive, synthetic materials. If you want a list of swimwear brands using less conventional, eco materials Elizabeth Stilwell of The Note Passer outlines them in her Guide to Ethical Swimwear. One drawback, however, is that they typically come at a steeper price. Wherever you end up buying, look for quality and for a suit you’ll covet for multiple seasons. For instance, if you outgrow prints quickly, my highlight choice here may not be the best option for you. The cop style is very now, but Bikiny’s solid bandeau is equally chic too. Kamea, the founder of Kamea World is publishing a book on conscious living. That’s rad! Preorder it here. Selva Beat, a vegan publication devoted to palm-free living, launched its first print issue! Download it free here. Everlane is proving there is real $$ in ethical fashion. What’s the deal with using recycled bottles in your clothes? H&M’s latest Conscious Collection harkens back to slow fashion with roots in art history. Oh, the struggles of ethical shopping.